Maybe it’s because it’s Canadian? Eh? However, strangely (to me anyway), the recipe left out raisins. The second time I made this, I added raisins, as well as a little extra nutmeg and cinnamon. If you eat it, slightly warmed — not heated, but just to take the chill off, on a bagel with cream cheese, it’s like a recreation of the carrot cake itself. Mmmm…. My family is Scottish and as such I feel it is somehow in my blood to enjoy and be good at making and cooking with marmalade. But after sampling a few different marmalades and making my own (courtesy of the Barefoot Contessa here) I discovered the unthinkable. I really don’t care for traditional marmalade. It’s too bitter and you can’t make a peanut butter sandwich with it. It’s lovely, and it’s easy to make, but I had my doubts. I tried another batch, this time instead of navel oranges using fresh and local mandarin oranges (although they were very seedy and required lots of seed removal), as well as a large can of crushed pineapple. While still generally unusable for a sandwich, it works on toast, and is also insanely good as a base for a meat marinade. 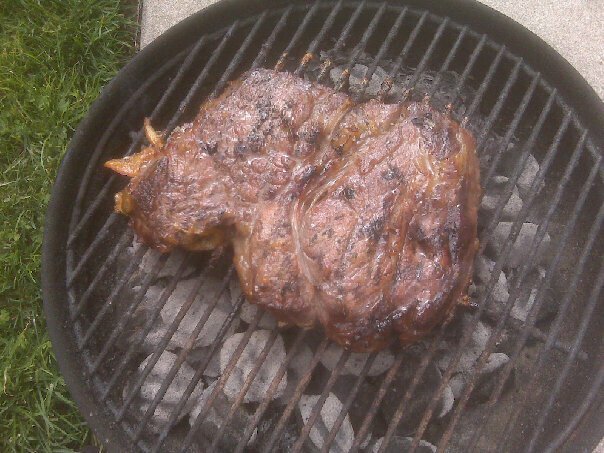 Here’s a nice steak marinated in a vinagrette with the orange/pineapple marmalade on the grill. The smell is fabulous. Call me mint jelly, cause I’m on the lamb! 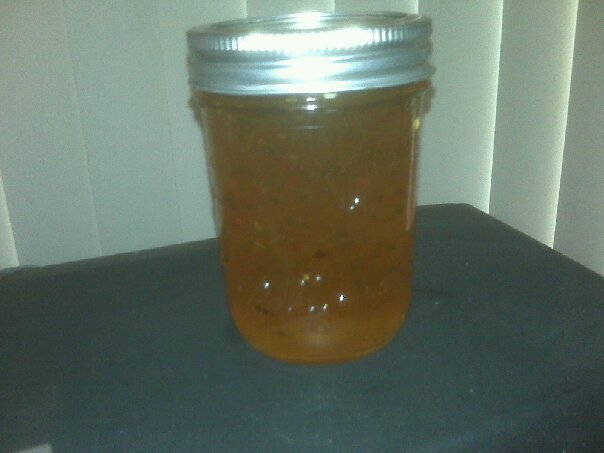 Pepper Jelly, aka the first time EVER that something was not spicy enough. 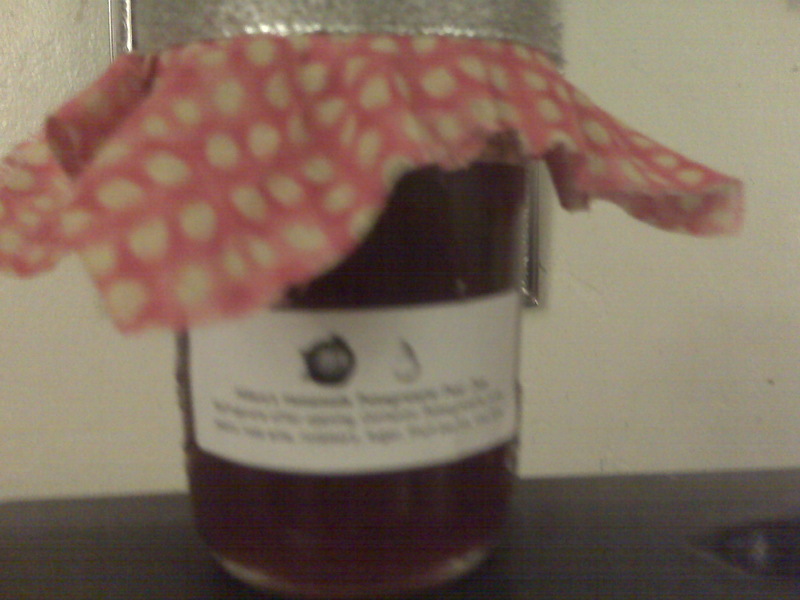 One of the perils of a good jam, jelly or preserve is that you really can’t taste it without burning your face. 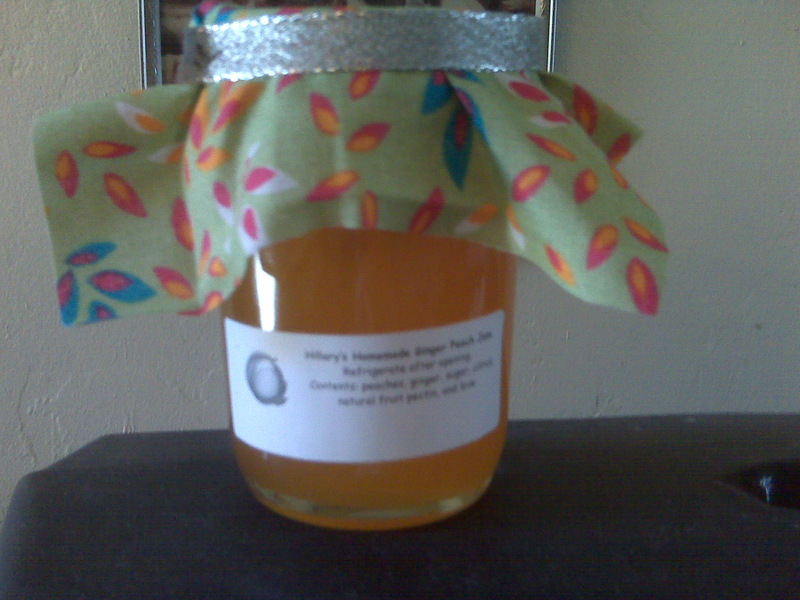 By the time you can sample and possibly make any change to the taste, it’s already cooled and in cute little jars. Quit being such a p**sy and go for the spice. Since I have never made (or really eaten, to my knowledge) any kind of pepper jelly, I figured I would follow the easiest recipe (calling for a red bell pepper, a green bell pepper, and 6 jalapenos with the seeds and ribs removed). It looked like it was going to be pretty mild, but I was unprepare for how sweet it was. Anyway, it makes a lovely jelly, it is awesome spread on a tortilla before the hot carnitas and cotija cheese is added, and it was great mixed with soy sauce as a spring roll dip. I plan to make a spicier version … perhaps more than a couple of versions, I’d like to have a variety in my pantry, from wimpy to pants-on-fire. And then there was … bacon. Bacon jam. I felt triumphant. 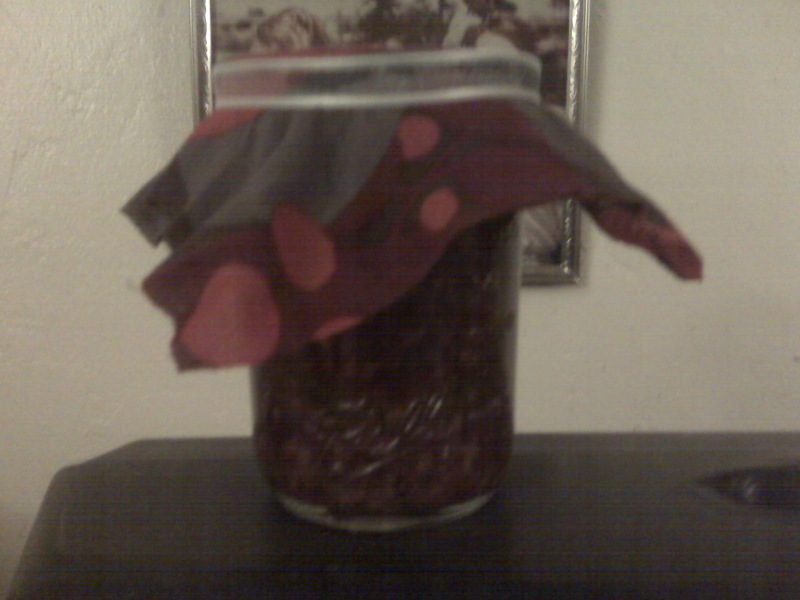 I had gone from being a jam virgin to making three relatively successful jams that people seemed to enjoy eating and hadn’t lost their eyesight or anything. I had some empty jars left over and was wondering what to attempt next when I came home to check my mail, just to find that Martha Stewart had dedicated a large section of the December 2010 issue of “Everyday Food” magazine. Page 100. Slow-cooker bacon jam. What. Martha, why do you mock me? I will make that bacon jam. Show you. Ok, I’ve had enough of your attitude. Just because it doesn’t have pectin and mounds of sugar? Just because it’s slow-cooked instead of forced to the rolling angry boil? Well, I am no expert. It might not technically be jam. But people love to eat it and people love to get it as a gift, neatly wrapped in a pretty piece of fabric. 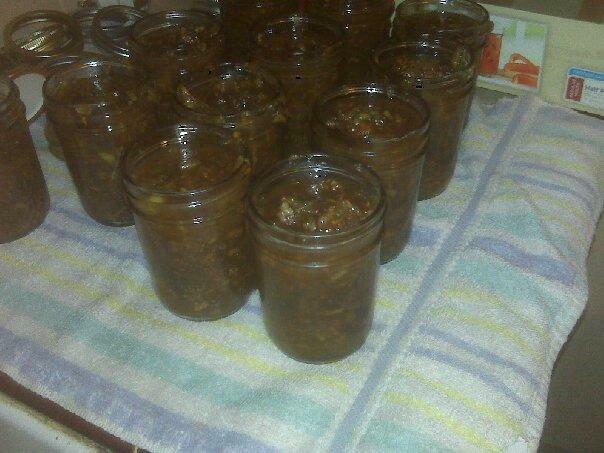 This was by far the most popular jam I made in 2o10 … even though I suppose it’s technically more of a tapenade or dip. 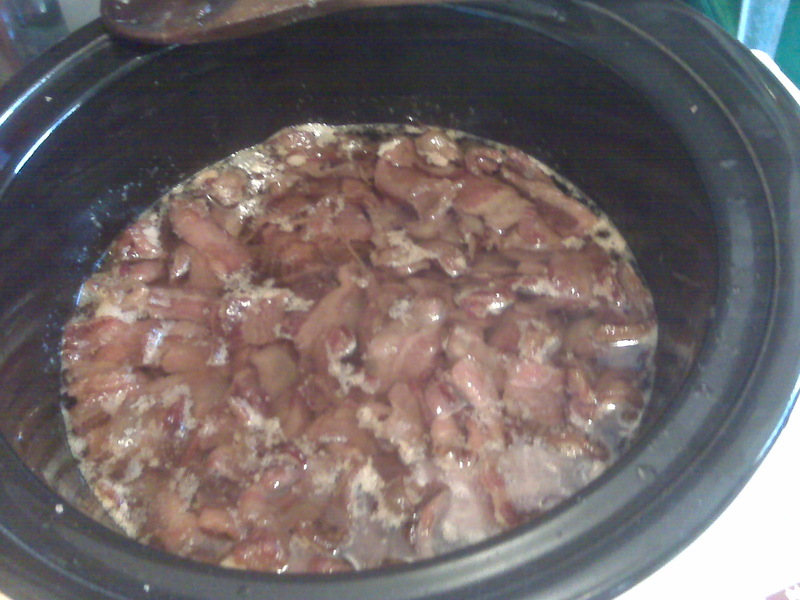 Here goes: render a massive amount of bacon – the recipe says 1 1/2 lbs but I doubled it to three and may have (ahem) used a little extra – in a big pot. 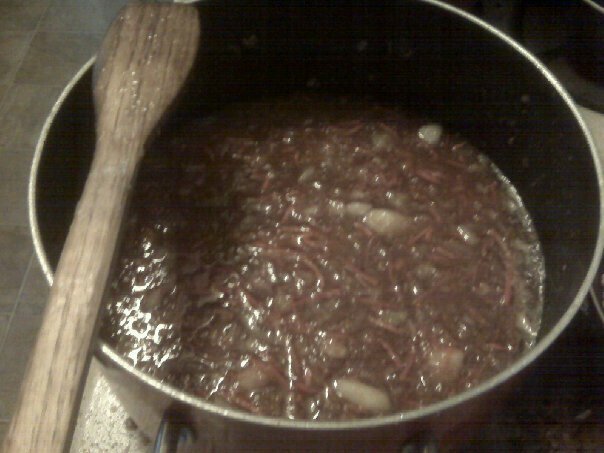 When it starts to smell like victory, add chopped onions, garlic, chives, and assorted things you like to use. 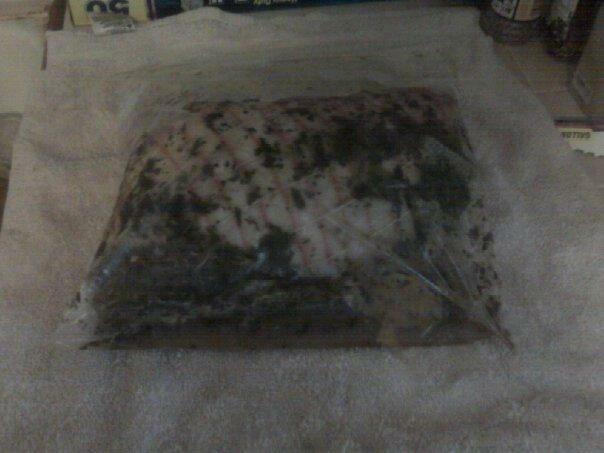 I added some extra herbs. Then add a cup of strong coffee, maple syrup, cider vinegar and some brown sugar. Put it all in your slow cooker, on high, with the lid off. Your kitchen will smell amazing. 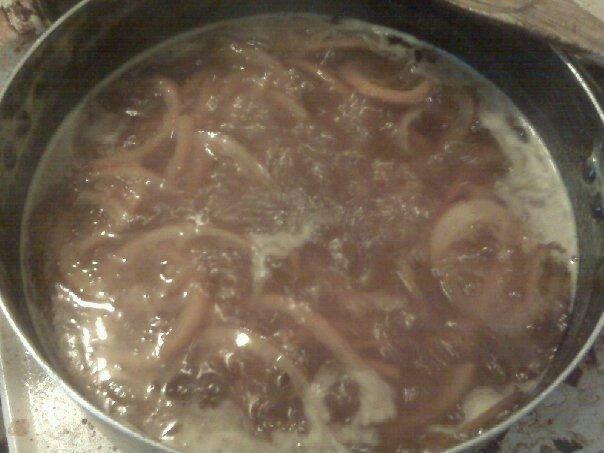 After the mixture starts to thicken and get bubbly and a little darker, it’s ready. I learned after two batches of this awesomeness that although bacon fat is … well, kind of the idea, it is a little bit greasy for some. If you’re giving it as a gift, skim off some of the fat, if for nothing else then because it doesn’t look pretty through the glass jar. This stuff is delicious on any sandwich. I also tried some with hot sauce and cream cheese as a tasty dip for tortilla chips. It is amazing. I have always loved ginger and peach together. A few years ago my ex and I ran a bartending company, and I was experimenting with different flavors in simple syrups. 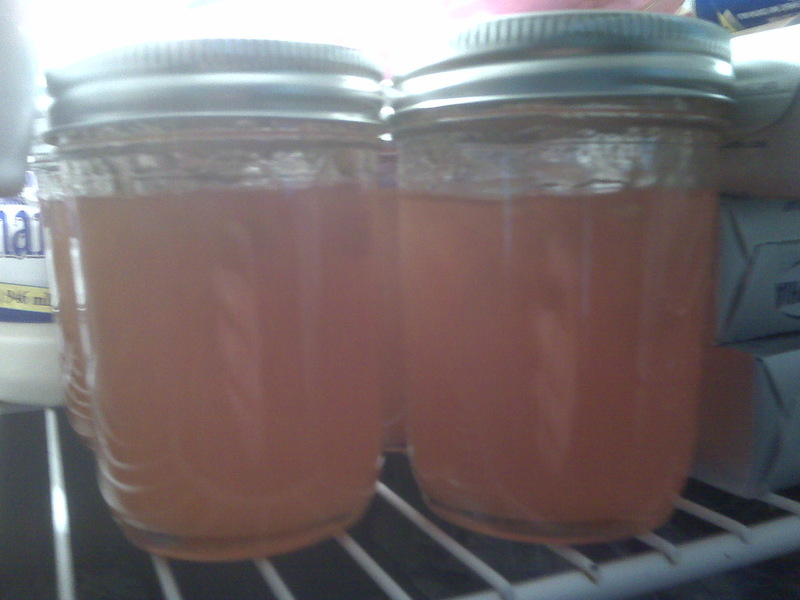 One of the tastiest ones I made was the ginger/peach. Really it’s a very simple recipe, as are most jams and jellies. A tasty fruit or two, in this case a fruit and candied root (packaged as “sugar ginger” at the asian foods store), a citric acid (usually lemon juice but sometimes wine or even a vinegar), sugar and pectin. I boiled the peaches (fresh or frozen, not canned, you definitely don’t want the extra sugar and preservatives in even a “light” syrup) with the chopped candied ginger, added sugar and pectin, and that was it. The whole jam-making process is way, way easier than I thought it was. Once the measurements are worked out, it gets even easier. I used the Certo brand pectin gel, which is sold in packets of two. It comes with an easy-to-use instruction sheet detailing the ideal ways to measure the fruit for certain kinds of jam, and how much sugar to add. For example, for a berry jam, you would use 4 cups of fruit, 7 cups of sugar and one packet of pectin. My layperson’s understanding of it is that the consistency depends on your ratio of sugar to fruit/citrus to pectin, so follow the instructions on whichever pectin you use. Once the three components are mixed together at a rolling boil, it is ready to ladle into jars and seal.